The Williams Encore Digital Piano is a Portable Keyboard. Though Portable, it is not as light as keyboard from other brands but the sound is superb. The Encore features 88 full-size Hammer-Action Weighted keys with 4 different touch-sensitivity setting, allowing users to select the feel that they enjoy most playing. The robust sound system encompassed 30 voices, 32-note Polyphony, metronome, Effects; reverb and chorus, Dual and Split voice modes. The Encore also comes with LCD display screen, 58 play-along practice songs, built-in amplified speaker, MIDI, sustain pedal, pitch-bend and modulation wheels and headphone jack. The Encore could also be use as a midi controller besides a digital piano. The feel of the weighted action keys is nice if you have tried the acoustic pianos or the semi-weighted keys. Other digital pianos of this price range do not include pitch-bend or modulation wheels but with the Encore it is great to have for a midi controller. The Williams Encore is the best for the price. The best feel and touch from the lower price models and some of the higher price models too. The Encore’s nice feel, pretty good tone and though there are not many sounds to choose from but a perfect portable digital piano keyboard for beginners and true musicians. Check it out. Taking into considerations the features for the price, you are actually getting a very nice keyboard instrument. Go for it! Enjoy! The Nord Electro 3 is a combination of other Nord models best technology. The new Nord Electro 3 features a new organ section, a new piano section, new effects section and a new sample library section. 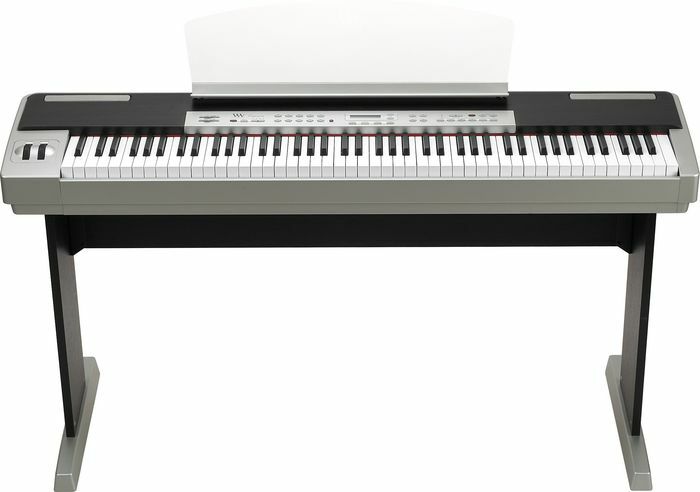 The Electro 3 digital portable piano features 61-key (5 octaves) or 73-key (6 octaves) velocity sensitive semi-weighted “waterfall” (square front) keyboard. Piano section: Only the best from the best quality were selected to include in this Virtual Electromechanical portable keyboard. The Electro 3 incorporates 5 selectable types of exquisite new pianos sound; three acoustic grands and two electric grands. The pianos sound come in the Nord Piano Library download area and you can change or replace if you wish. You can also choose the sounds from the Library area for free. The Sample Editor allows you to add any sound you love to the Electro 3 and is a great tool to assist you to create sounds according to your personal choice. The Nord Sample Editor is compatible with Windows XP and Vista, and Mac OSX. Organ section: The Electro 3 is even equipped with four selectable tone wheel modes, that stretches from a clean sound to battered unit with the most dramatic setting; vintage 3(B3, Vox Continental and Farfisa with full Polyphony). This setting even produces a sound in the background of its own, even if you don’t touch any keys. The sound of B3 produce by Electro 3 sound truly original which I find difficult to differentiate. The Vox Continental and Farfisa are just as impressive as the B3. The massive savage sound created by their 12-top oscillator frequency-divider designs is of course also a no sample zone in the Electro 3; you have the same behavior and unique response from our models as in the original instruments. Organ split: Using the Organ Split mode, you can play two different organ registrations in a dual manual fashion, one sound on either side of a user definable keyboard split point. Connect a second MIDI keyboard to the Electro 3, to use the organ split functionality, but in a true, dual manual setup. Effect section: The Nord Electro 3 comes with a good selection of quality Effects and Reverb. Effect 1 comprises a selection of pan, tremolo, auto-wah, pedal-wah and ring modulator. Where as, Effect 2 comprises phaser, flanger and chorus and five algorithms (Room, Stage Soft, Stage, Hall, Hall Soft) Reverb. For the final stage, players can further enhance the sound system and effects by choosing from a selection of three amplifier /speaker simulations, compressor and rotary speaker which could add any amount of distortion and grit from gentle to mania level. The Electro 3 also features a new function in the Rotary Stop Mode. Users can switch between fast and stopped rotation and back using either the controls on the panel or foot pedal. This is an improved features of the early one-speed original rotary speaker units. A user adjustable settings like speed for both treble and bass rotors, and acceleration speed. 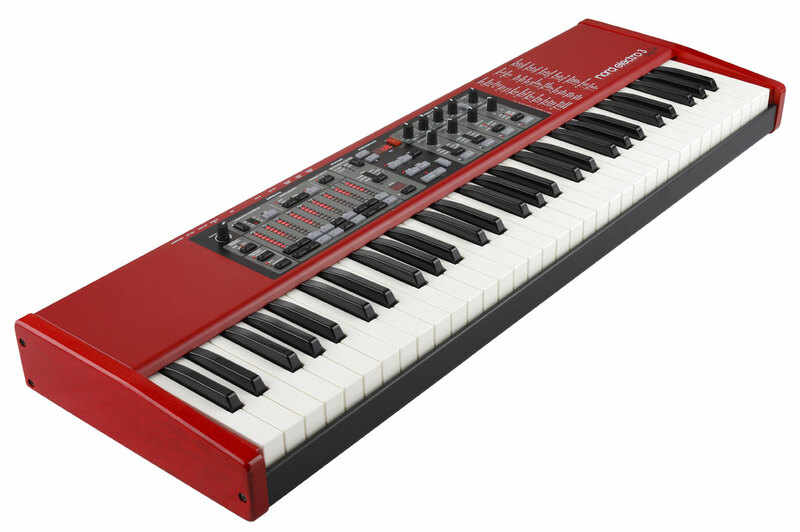 The lightweight (61-key 15.3 lbs) yet roadworthy design, affordable and the simple to use features makes Nord Electro 3 a truly digital musical instrument. The Yamano Hand-Roll Piano is the Only brand Voted as “The Most Amazing Inventions” by Time Magazine editors. The Hand-Roll Piano features full size 61-Standard Key (five Octave) and incorporates lot of tones and rhythms: 128 tones repertoire and 100 rhythms, The Hand-Roll Portable Keyboard also integrate 16-note Polyphony and 20 demo tunes. The Roll-Up piano can operates on 4-AA batteries or AC Adaptor. The portable piano comes with built-in speaker, headphone output , external speaker output and MIDI Output-16 Output Channel Design: with midi cable it can communicate with PC. The uniquely designed piano weight merely 2 lbs which makes it extremely light for anyone to carry. This amazing Roll-Up Piano is not only useful and handy, it is cool, neat, does not requires storage space and you can play whenever and wherever you love. It is also an affordable keyboard and a perfect gift for anyone; kids, amateurs, serious students or professional musicians. The gift looks exclusive and will last for a very long time for users. When you step on the stage, you want to have a keyboard that sounds not only amazing, you want one that makes it easy to access sounds and features, is versatile and reliable, feels awesome, looks great, rugged and is downright fun to play! That is where the Yamano Hand-Roll Portable keyboard comes in and what most musicians are waiting for. The new Korg M50 Music Workstation is the latest in Korg’s workstation family. The M50 61-key workstation weight just fifteen lbs. Besides being highly portable, the M50 encompass the best sounds and is an affordable new keyboard instrument. The M50 has 61-key and 73-key versions (weight 17.6 lbs) using a new semi-weighted Natural Touch keyboard. Whereas, the 88-key M50 ( weight approximately 46 lbs)features RH3 keyboard (Real Weighted Hammer Action 3) with 4-zone graded action response. In another word, there is one for everyone. The M50 features a large Touch View screen and an exclusive modern design angled control panel to ease viewing. In addition, the M50 includes four Chord Triggers that provide a versatile and fun way to play chords and trigger hundreds of drum patterns and over a thousand of arpeggiator patterns, enough to inspire musicians. The amazing M50 incorporates 600 individual sound programs, offering three layers of stereo switching and an additional resonance layer for faithful and natural reproduction of the workstation’s entire dynamic range. The M50 provides generously five Insert Effects, two Master Effects and one Total Effect, along with one hundred seventy Effects types, bringing sounds to life. An independent three-band EQ is available for each Program, the Drum Track and each of the sixteen timbres.The sequencer provides 16 MIDI plus 1 Master tracks with all the tools needed to capture and easily shape musical ideas into polished productions. It can record up to 128 songs, allows users to record 210,000 notes and offers a high resolution of 480 PPQ (parts per quarter-note). In addition, the music workstation comes with Dual Oscillators: single and double, Maximum Polyphony: 80 voices single mode. The M50 Editor and Plug-In Editor software allows users edit the sounds using a computer, and allows the M50 to act as a plug-in instrument for their DAW (VST, Audio Units and RTAS are supported). The editor librarian also enables users to exchange sounds between the M50 and M3. Further, an SD card slot provides easy and affordable management of Programs, Combinations and Sequences, as well as sounds, songs and other data. The M50 portable keyboard is a complete workstation, full of sounds and features. No other keyboard in its class offers anything close to this level of elegance or intuitive ease-of-use. Grab one M50 back to the studio or your home and you can start making music. * 73-key version would be available in March.